Our Bed and Breakfast had a little deck which was just a short distance from our room on the second floor. This provided a great spot to try and capture some nice photographs. This is probably one of the best shots from the many that I took. 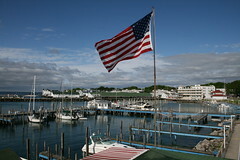 I love the flag flying as the main attraction with the grey clouds behind it and then the boats and other buildings filling in the rest.